Dill pickle chips get hot with sriracha sauce. Photo by Katharine Pollak | THE NIBBLE. This is Page 2 of a 5-page glossary of the different types of pickles and pickled vegetables. Some of the terms below include dill pickle, dilly beans and gherkin. After you’ve peeked at the pickles, take a look at our other food glossaries—an easy way to get up to speed on more than fifty different food categories. 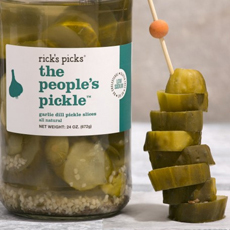 The dill pickle is the most popular variety of cucumber pickle in the U.S. Originally made with fresh dill weed, today dill oil is added by commercial manufacturers (artisan producers will use the fresh herb and often pickling spices—mustard, pepper, garlic, etc.—as well). There are many types of dill pickles. See also Genuine Dill, Kosher Dill, German Dill, Overnight Dill, Polish Dill. The longer pickles ferment, the darker they become. 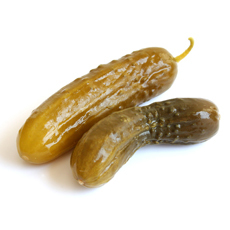 Compare the color of these dills to the bright green half-sour pickles on the next page. Dilly beans. Photo courtesy FoodInJars.com. Here’s the recipe. 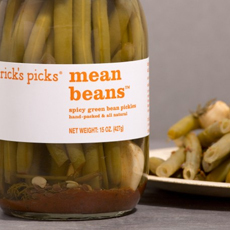 Spicy pickled string beans, which are made with hot red chiles, along with garlic, mustard seed and pickling spices. Here, salt is used to ferment the cucumber: The pickles are covered with brine (salt dissolved in water). Vinegar is usually added to the brine for flavor, and seasonings are added during the final stages of fermentation. Dilly beans from Rick’s Picks have wasabi heat. Photo courtesy Murray’s Cheese. Seasonings added to the brine at the end of fermentation can create a variety of different profiles, including Cajun, dill, kosher and zesty. These are the most common commercial varieties; artisan producers can create any flavors from curry to wasabi. One of the most common methods for producing commercial, jarred pickles. The pickles are not fermented, but are preserved in jars with vinegar (sometimes with lemon or lime juice) and seasonings. Salt firms the texture and concentrates flavor. 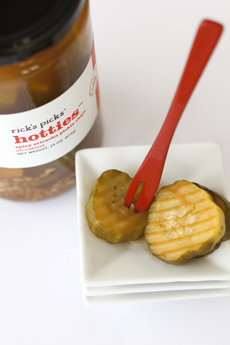 After bottling, the pickles are pasteurized, providing a shelf life of about 18 months. 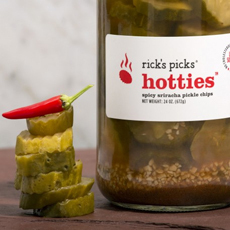 Sriracha-flavored pickles. Photo courtesy MurraysCheese.com. Dill pickles made by the slow, “processed” method. Dill weed is added to the tanks during the last stage of fermentation or to the jar after fermentation. 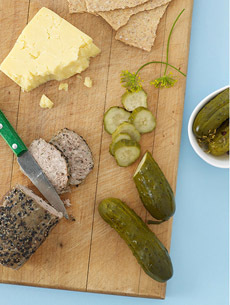 These pickles usually have a higher lactic acid flavor; they taste more concentrated and sour than other dill pickles. An unfermented style of pickle, which does not use a brine, but pickles the cucumber in vinegar or lemon juice. This creates a less sour flavor. Dill pickles. While half-sour pickles retain the bright-green hue of a cucumber, dills turn darker from the brine. Photo courtesy PachD.com. A gherkin is not only a pickle of smaller size, but also a particular species of cucumber—the West Indian or Burr cucumber (Cucumis anguria), which produces a somewhat smaller fruit than the garden cucumber (Cucumis sativus). Some gherkins are made from the West Indian cucumber, but most are made from the garden cucumber. And yes, the cucumber is technically a fruit, not a vegetable: its seeds are contained on the inside. Gherkins can be dill or sweet. They are used to garnish appetizers and sandwiches, are served with sausages and pâtés and enjoyed as snacks. Chopped sweet gherkins are added to egg, macaroni, potato, seafood and tuna salads. Gherkins. Photo courtesy Rick’s Picks.